This May, the Bay Area will once again be home to the premier runway event of the year, Charity Fashion Show. This is the largest fashion show on the West Coast, and twice the size of our 2009 event, an event that was nominated for more SF Fashion Awards than any other. 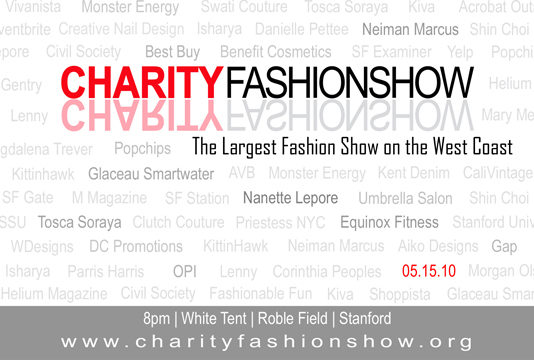 On 05.15.10, Charity Fashion Show will spotlight over 40 designers, including the well-known Nanette Lepore and Shin Choi, West Coast favorites Kittinhawk and Clutch Couture, and San Francisco 2009 Designer of the Year AVB. A wide range of sponsors, including Smartwater, Equinox Fitness, and Popchips, will be at Charity Fashion Show 2010 with giveaways.